Home CDN , children , crafts , December , feature , holiday , holidays , homeschool , papercrafts , printables , US , worldwide December 7th - Freebies! -- Peeps are marshmallow candies, sold in the US and Canada, shaped into chicks, bunnies, and other animals. There are also different shapes used for various holidays. Peeps are produced by Just Born, a candy manufacturer based in Bethlehem, Pennsylvania. 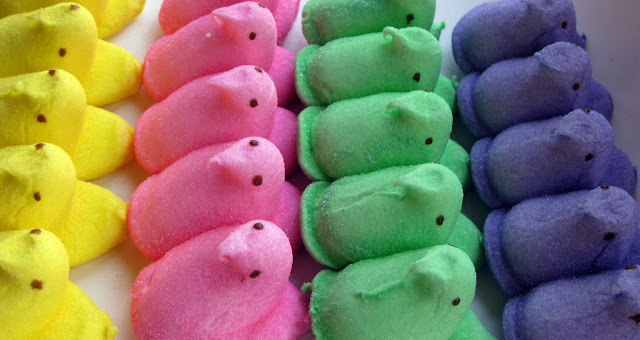 Peeps were introduced in 1952 by Russian immigrant, Sam Born. -- Featuring 50 winning PEEPS-inspired recipes from some of your favorite food bloggers, along with some fantastic original recipes from the folks at Just Born, the makers of PEEPS. You will learn how to make adorable PEEPS-styled cupcakes, pops, cookies, cakes, brownies, and more. Indulge in PEEPS-Stuffed Chocolate Chip Cookies, PEEPS Party Cupcake Cones, No-Bake Lemon PEEPS Cake, PEEPS Macarons, and even Frozen PEEPS-icles. • Wilton Peeps Cookie Cutter Set -- Celebrate Peeps with fun and festive cookies, using the Wilton PEEPS Cookie Cutter Set. Convenient metal cookie cutters are perfect for creating iconic Peeps shapes. Cut PEEPS Marshmallow Bunny and Chick cookies. Includes Roll-Out Cookie recipe. -- This behind-the-scenes look at the Just Born Candy plant in Bethlehem, PA gives viewers an up-close look at the making of the popular marshmallow peeps and other tasty treats. - At 7:55 am (local time) Dec 7, 1941, a date that will live in infamy, nearly 200 Japanese aircraft attacked Pearl Harbor, Hawaii, long considered the US Gibraltar of the Pacific. The raid, which lasted little more than one hour, left nearly 3,000 dead. Nearly the entire US Pacific Fleet was at anchor there and few ships escaped damage. Several were sunk or disabled, while 200 US aircraft on the ground were destroyed. The attack on Pearl Harbor brought about immediate US entry into WWII, a declaration of war being requested by President Franklin D. Roosevelt and approved by the Congress Dec 8, 1941. - Cotton Candy was originally called fairy floss. It is made from Floss (or Flossine) sugar. The Cotton Candy machine was patented in 1899 by William Morrison and John C. Wharton. They brought it to the St. Louis World's Fair in 1904, where it was quite popular. Cotton Candy is a favorite at amusement parks, circuses, fairs, and sports venues. - Letter writing is an almost lost skill. Most letters and notes nowadays are on emails and instant messages. Or, they are typed on an internet keyboard. Take a few minutes, and send someone a handwritten letter. - Launched December 7, 1972, with a three-man crew — Eugene A. Cernan, Harrison H. Schmidt, Ronald E. Evans — who explored the moon, December 11–14. Lunar landing module named Challenger. Pacific splashdown, December 19. This was the last manned mission to the moon. - A day to raise awareness of the importance of international civil aviation and the role the International Civil Aviation Organization (ICAO) plays in international air transport. The organization is a United Nations (UN) body responsible for developing international standards for aviation safety. - The National Fire Safety Council was formed in 1979 to encourage education and the prevention of burns, especially among children. With ovens cooking, tree-lights kept on, candles, children, pets and Aunt Bertha sleeping with a ciggy hanging out of her mouth; we can't watch it all. Take a look around your home and/or office and make it a safety zone. At home, make sure you have multiple exit strategies for all people and animals in your home. If you hear a fire alarm from a neighbors house, take the extra minute, to knock on the door, to ask if everything is OK. Most of the time it will be... but.... what if you were needed? - On December 7, 1963 TV and sports history was made when the first instant replay ever seen on the air was broadcast during the Army-Navy game. The creator was 29-year-old wunderkind CBS television director Tony Verna, whose illustrious show-business career has spanned over 50 years of Sport and Entertainment history.